As someone who spends a lot of time in the kitchen cooking and baking delicious meals, I can tell you that having quality cookware and equipment makes a huge difference! That is one area I always look for a good product and am willing to pay a little more to get it. I want it to be long-lasting and make my job preparing meals easier. I recently had the opportunity to try out two new products from the new Circulon® Prime range collection with great results! The Circulon Prime range was launched in Canada in Fall 2014. 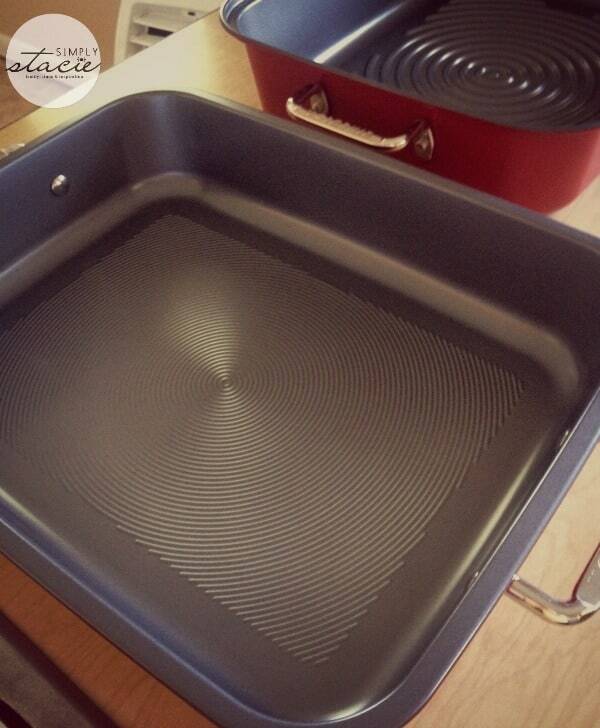 It uses Circulon’s Total non-stick system, a patented hi-low circular groove technology. It allows you to cook without using fats and oils and promotes a healthier lifestyle. 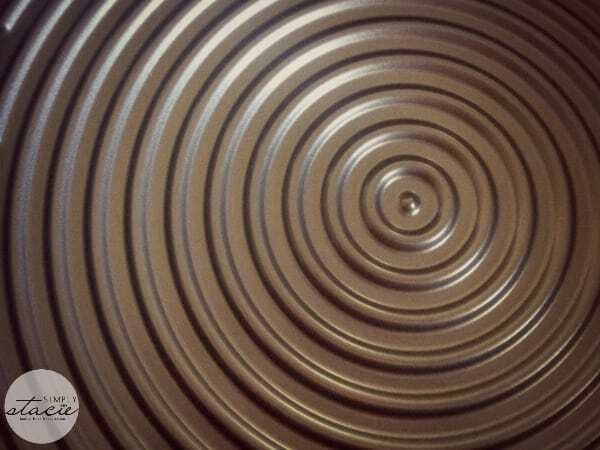 Also each pan is cooktop suitable, oven and dishwasher safe and is backed by a lifetime guarantee. 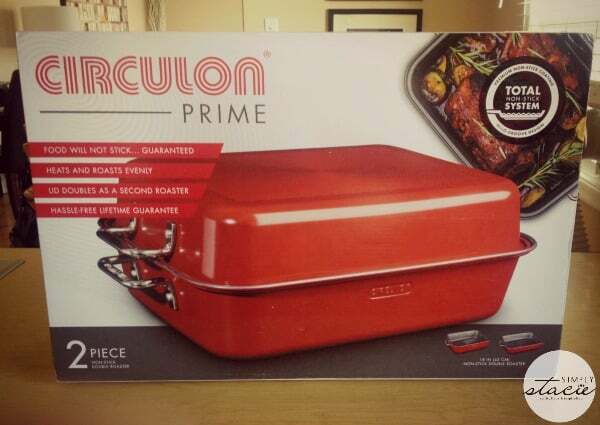 The first item I tried from the collection is the Circulon Prime Double Non-stick Roaster. It comes in two pieces and the lid also doubles as a second roaster making it multi-functional. 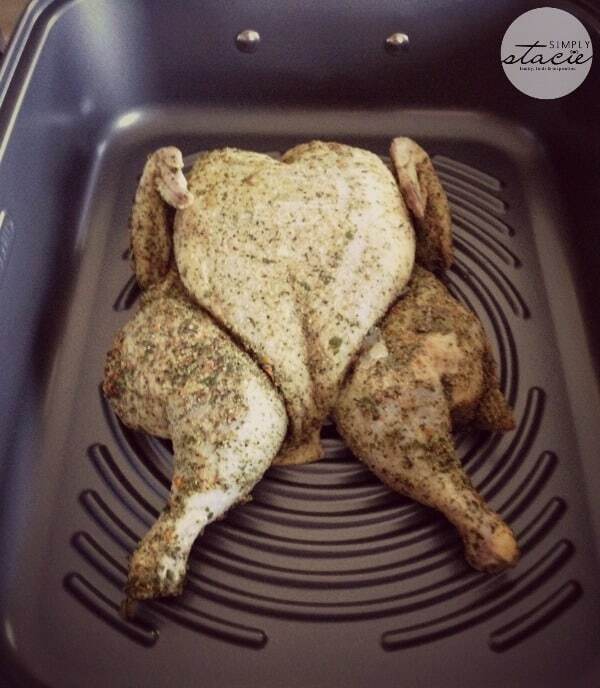 It’s oven safe up to 450ºF and can be used for both slow cooking and quick roasting. The roaster itself is made of carbon steel and is PFOA, lead and cadmium free. I love the snazzy red colour on the exterior! The inside of the roaster uses the total non-stick system and also has a long-lasting non-stick coating. They guarantee that food will not stick. 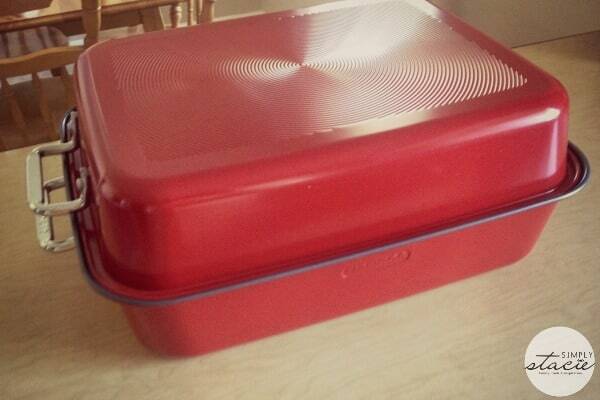 This is the inside of the lid which as you can see is also non-stick too. It’s great to have two roasters if you are cooking for a crowd. Hello Thanksgiving! It’s also a good size (18 inches) and will fit a turkey. I used it so far for roasts and chickens. Here I used a roasting chicken and as you can see there is lots of room left over! 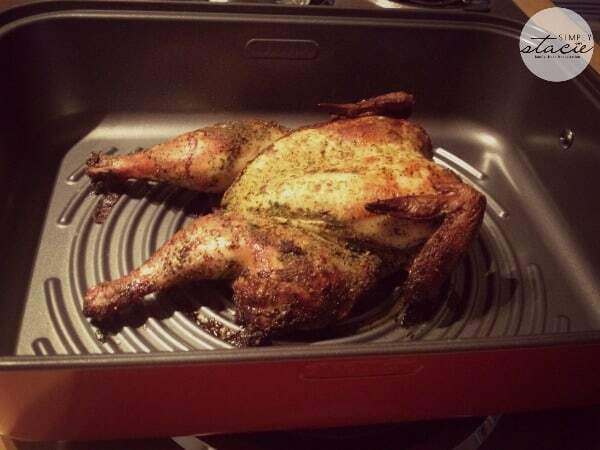 It roasts evenly and the chicken tasted delicious. It was juicy and bursting with flavour. There’s nothing worse than a dry piece of chicken and I was very pleased at how it cooked the meat. Plus, it’s non-stick so no greasing the pan is required. The chicken came out easily and I didn’t leave half the meat in the roaster! I was curious to see how the clean up would be. Would I have to leave it soak in a sink full of suds to get it clean? Would it be hard to clean between the grooves? I’m happy to report it was SO EASY to clean. I didn’t have to soak it and washed it like normal. Cleaning between the grooves was not an issue because they are spaced out and you can get in there with your washcloth and fingers. I’m ready for Thanksgiving this weekend and have the tools I need to make us a meal to remember. 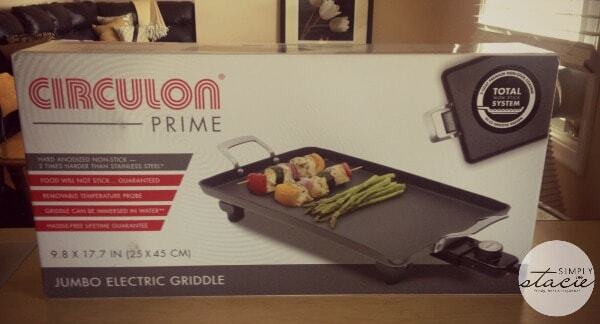 I also had the opportunity to try out the Circulon Prime Jumbo Electric Griddle. I love this product. Where have you been my whole life? You have made cooking breakfast a million times easier! It features an extra large cooking surface at 9.8 x 17.7 inches. It’s also metal utensil safe and comes with a removable temperature probe that ranges from 200°F to 440°F. It also has a 3-Layer Total Non-Stick System and offers the same guarantee: food will NOT stick! It’s more durable and two times stronger than stainless steel. I like the fact that you can use it for a variety of food. I’ve made grilled cheese sandwiches, eggs and bacon and pancakes so far with it. It feels weird using metal utensils because I’ve always been told NOT to and that it will damage the non-stick coating. That’s not the case with this griddle! Normally when I make grilled cheese sandwiches I’d do it in a frying pan on the stove. It only holds two sandwiches and here I’m making six at once. It cuts down on time I’m spending in the kitchen and is making better USE of my time. Clean up is easy and once you remove the power cord you can immerse it in water in the sink and do dishes like normal. Pick up the Circulon Prime Double Non-stick Roaster ($169.99) and Circulon Jumbo Electric Griddle ($49.99) exclusively at Canadian Tire. Check out the items in the Circulon Prime collection! I’ve got my eye now on that straining stockpot! What about you? Heads up! Circulon Canada is hosting a giveaway on their Facebook page. The prize? 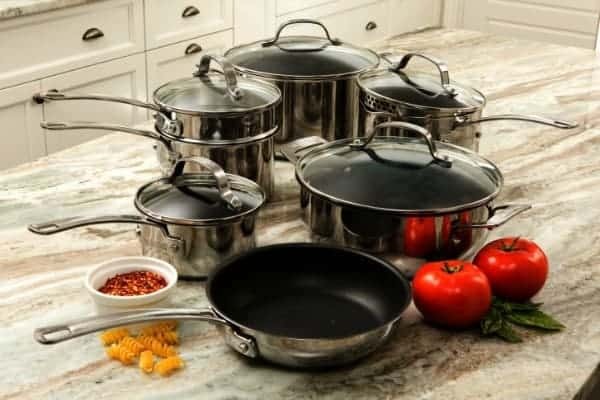 Weekly prizes from the Circulon Prime cookware line and a grand prize of a Foodie Getaway to Montreal. Go enter! Connect with Circulon Canada on Facebook and Twitter. This looks so fantastic! What a great idea. I would sure love to win it! would love to own a 6qt (5.7 L) Covered Straining Stockpot (with a locking lid). I would like to own the 6qt (5.7 L) Covered Straining Stockpot (with a locking lid), please.